This elaborate 15-piece brass Nativity from Ivory Coast was created using the lost-wax casting technique. In this labor-intensive process, the artisans make individual wax figures over an open fire until exact. Reeds, as tubes, are fixed to the top of each figure. The wax is then dipped into finely powdered mud several times, with hardening in between applications. This process forms a clay casting around the mold. Next, the clay is heated until the wax melts and pours out. Using the tubes, molten brass is poured into the space left in the clay form by the wax. When the brass has cooled, the clay is broken away. Any necessary finishing details are then done by hand. 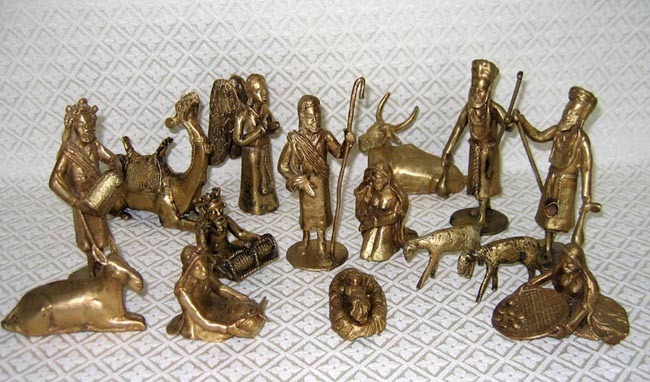 The set includes: the Holy Family, an angel, two shepherds holding sticks and cloth pouches, a village woman with a woven tray of food, an ox, a donkey, two sheep, three wise men, and a camel. The shepherds stand 6 inches tall.